Holy cow! Or should I say, holy tofu?! Woooo! It's getting hot in here [literally]! And that's because I just had an amazing dish that had a kick to it. In lieu of a meaty dish, I went ahead and recreated this delicious kale soup a la vegan style. Have you ever tried a restaurant dish that looks so ridiculously simple, yet tastes so heavenly and so complex that it invites all of your sense to go, "oooohhhh ahhhhhh.....mmmm"? Well, that one dish is the Spicy Italian Sausage Kale soup that I once tried at The Greenhouse Cafè. I decided to make this lighter variation of the soup, all whilst crossing my two little fingers in hopes that it would come out somewhat close to the original version. And I am happy to report that I did it! In my humble opinion, this healthy dish comes as close as it gets to Greenhouse Cafè's recipe! (At least taste wise) I'm still not sure what drug ingredients they put in it. Grab a medium-large pot and heat it up on low medium heat. Pour the olive oil and let it heat for about 30 seconds. Throw in the sliced onions and sauté until it becomes slightly translucent. Add sprinkles of black pepper. After cooking for approximately 5 minutes, add the carrots, celery, and tomatoes. After mixing it a bit with a wooden spoon, pour in the water and bring it to a boil. Then, add the bouillon cubes and let them "melt". Add the garlic, kale, salt, nutritional yeast, cooking wine, lemon juice, and the rest of the spices and herbs. Bring it down to a simmer and cook for about 8 minutes. Now add the chickpeas and dry pasta. Cook for about 5 minutes or according to pasta cooking directions. Voilà! Serve in pretty bowls and garnish with crunchy crackers. I used pita chips! 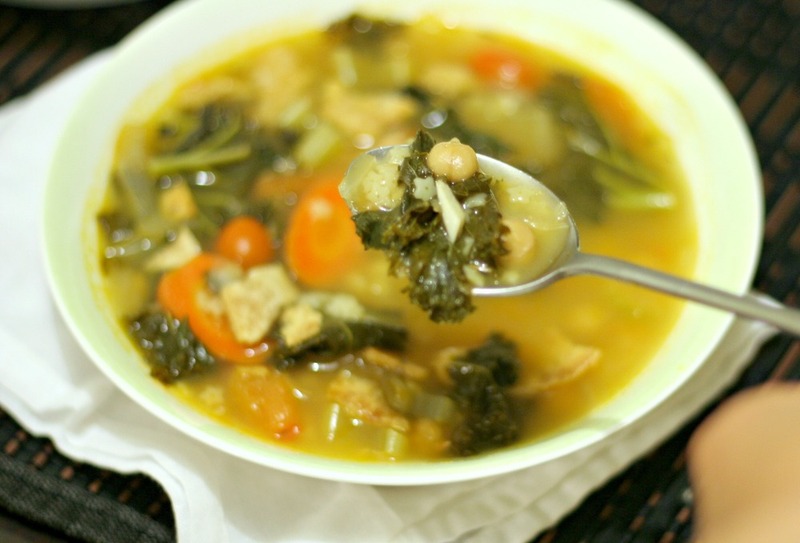 ***If you don't have vegan bouillon on hand, you may use anything like vegetable (or even chicken) broth. If you end up using a liquid broth, make sure to adjust the water measurement. I used the Rapunzel brand, which can be found at most health food stores. Lots of spices! But these are the ones that create such a strong flavor. So there you have it! The successful recreation of a dish that I've been craving for a long long time. I am officially done with the DIY invitations and they were sent out today. Weeeee! Fortunately, Emily and Susan have helped me more than I can thank them for. Nevertheless, it was no easy task trying to overcome obstacles such as printing glitches, items that I forgot to purchase, etc. I was aiming for a DIY invitation that would make one feel kind of "at home" and of course, one that would actually look like a DIY without looking too "cheap". Opinions may vary and I can already see the expressions of some traditionalists as they open the envelopes, but what matters is that I had so much fun making these. And to top it off, they were made with LOVE. I have to admit that all the preparation has been bringing the inner artist in me that has been long lost. I am hoping that it's here to stay, especially when I am so incredibly inspired by people like this awesome woman! Even her blog title is so cool. Aloha brah! Since I didn't want to spend a lot of money on decorative chalkboards for the wedding, I looked up the 'how to' on the search engine and her blog popped up. Her creation is nothing short of amazing, and I'm pumped to make chalkboards at home. The best part about it? I can make them any color I want for less than 50 cents each. Think, pretty lilac and pastel green chalkboards. Muahahaha! I'm thinking of writing a post about the sites and locations that I've been to in order to get decoration items for cheap. Especially for those readers who live in Canada and California, pretty much everything is double the price of other states in the U.S.! Oh yeah, and Greg and I had our engagement photo shoot yesterday! It was so much fun and I really wish I could do it all over again. I hope you have a beautiful weekend and talk to you soon! What was the latest DIY project you've worked on, or want to work on? Do you prefer brothy or creamy soups? Favorite recipe?